Before World War Two all tyres were measured in the same way, whether they were for lorries, cars, motor cycles, pedal cycles or wheelbarrows. This size was expressed as two numbers: the first being the overall diameter of the tread and the second being the height of the tread above the wheel rim; eg: 28×1½. If, for some reason, you wanted to know the rim diameter you just doubled the second figure and subtracted it from the first; eg: a 28×1½ tyre fits a rim 28 - (2 × 1½) = 25 inches in diameter. Of course, this meant that a 28×1¾ tyre could not be put onto a 28×1½ rim but, since no one was daft enough to try it, this didn’t really matter. This system was simple and easy to understand; therefore it had to be changed. An early attempt to add confusion to the system was the introduction of ‘Carrier Oversize’ tyres; eg: 26×2×1¾ is a 2" section tyre that fits a 26×1¾ rim. Carrier tyres seem to be the only ones that use this system (though 20×1¾×2 tyres for low gravity carriers don't fit into any known system), all other oversize or undersize tyres being measured the other way round; ie: a 26×1½×1¾ tyre fits a 26×1½ rim. In France the metric system was adopted so metric tyre sizes were introduced. The tyres were really the same size of course, so a nominal conversion factor of 25mm = 1 inch was used. The following conversion tables can be used to swap between the two systems. Thus a 650×35A converts to 26×1⅜ and a 700×35C to 28×1⅝×1⅜. The advantage of this system is that it is easy to tell which sizes will fit which rim. Any 700C tyre will go onto any 700C rim - but avoid putting very wide tyres on narrow rims and vice versa. This page is about pedal cycle tyres but a quick word about French motor cycle tyres won’t go amiss here. Old French motor cycle tyres use a similar-looking system but it’s not quite the same—it doesn’t have the final letter. So, for example, a 600×65 equates to a 24×2½ or 2.50–19. This metric system, although universal in France, seems to have gained less of a foothold in other parts of Europe. What I shall call, for want of a better name, the ‘German’ system uses imperial measurements in a bizarre mixture of fractions and decimals. So far I have been unable to deduce any logical sequence to the system. The 1⅝ nominal section is really 1¾ - please don’t ask why or I might burst into tears. Which means that a 700C tyre, although it may also be marked as 28×1⅝ will fit on an old British 28×1¾ rim. Motor vehicle tyres adopted a new system after World War Two. The first figure being the tyre width and the second being the rim diameter. To highlight the difference between new and old systems, decimal fractions were used for the tyre width. A few moped tyre sizes that are similar to pedal cycle tyre sizes are shown in the main table. Another drift away from the original system occurred at the end of the 1930s with the introduction of the well-known 27×1¼ tyre. (Note: there was a 27×1¼ before this but it had already become obsolete when this later version was introduced. If you have a cycle with this pre-1930s 27×1¼ size of wheels, the bad news is that the later tyres won’t fit ... but the very good news is that 700C tyres will.) There are several 27" sizes which all use the same rim diameter; so these are not using the traditional system of measurement even though they look as if they are. The same applies to the ‘Moulton-Wolber’ 17×1¼ tyre: a sort of miniature 27×1¼. The trouble with bicycles is that they last for a very long time. In order to sell more bicycles the industry has to find a way of forcing people to buy them. Fashion has been a powerful force here and many people have bought ‘Mountain Bikes’ which are totally unsuitable for the uses they are put to. Another wheeze has been to introduce a new range of cycle tyres and gradually withdraw the old ones, so a new bike is needed when the old one’s tyres wear out. A cunning feature of the new Imperial sizes is that none of the numbers used bears any relation to an actual measurement; however, to start with, the system was based on rim diameters of a whole number of inches. A 26×2.00 tyre and a 26×2 tyre are interchangeable since both use a 22" rim. A 26×1.75 tyre has a rim diameter of 22" so will not fit a 26×1¾ rim but will fit a 26×2 rim, as will a 26×2.125 tyre. It’s probably best not to try thinking about sizes like 12½×1.75×2¼. This new system seems to have originated in the USA but with a few German sizes thrown in to confuse. Having mentioned the USA, I suppose it’s time to describe their tyre sizes. In America everything is bigger - or so Americans would like to think. To preserve this illusion the sizes written on the sides of American tyres are larger than the tyres really are. Once the ‘26’ size had taken over the MTB market, it was time to change again: enter the ‘29er’ Mountain Bike. These ‘29-inch’ disrupt the whole-inch rim diameter pattern because they’re not really a new size at all: they’re the good old 700C size repackaged. Close on the heels of the 29 size came 27½. Again, this is based on an old size: 650B. At repeating intervals throughout the history of the bicycle, enterprising manufacturers have come up with ‘puncture-proof’ tyres by the simple expedient of making them from solid rubber. After a short time, people realise how bad they are and they vanish again. However, modern plastic technology is getting closer to making a decent solid tyre and one of the latest incarnations of this idea, produced by the Green Tyre Co, seems to be lasting longer than its predecessors did. For the collector with a large number of cycles, or a museum, solid tyres can be a good solution to the problem of keeping a large number of tyres inflated on seldom-used bikes. Green Tyres use the same mixture of measurements as everyone else except they call their 26×1⅜ tyre a 26×1.375. Unlike pneumatic tyres, solids also have to be the right width for the rim - so, for instance, a 26×1.375 tyre won’t squezze in to a Dunlop 26×1⅜ Narrow rim. Since tyre manufacturers do not want to suffer the same confusion they have foisted onto the rest of us, they use their own system of ‘ETRTO’ sizes, which show the actual tyre width and rim diameter in millimetres. The ETRTO system was also adopted as the basis of ISO 5775 so, if you see a size described as ‘ISO’, this is the same thing. The ETRTO size is, nowadays, about the only measurement on a tyre that can be trusted to bear any resemblance to reality. If you’ve got an obscure size of rim and need to know which tyres will fit, measure all the way round the bead seat. Divide this measurement (in millimetres) by pi (3.14159265358979323846264 or thereabouts). Get a tyre with an ETRTO size whose second number is the same as your answer. There is one quirk in the ETRTO sizes: those based on the 24×1⅜ tyre are sometimes described as 540 and sometimes 541. Clearly, a 1mm variation in a tyre this big makes no discernible difference. Here's a photo of a tyre I bought in Gabon in Africa just before the turn of the Milennium. I supposed that it would fit the wheels of my Raleigh Activator but was disappointed. (One needed 559 as the bead seat diameter for many straightforward "Mountain" bikes.) As a matter of principle after my tours of duty in Gabon I brought the bike and the tyre (I had bought two) back and still have it all. The Dagworth & District Gentleman’s Cycling Society accepts no responsibility for anyone who believes this lot implicitly and, as a consequence, buys a tyre that won’t fit. 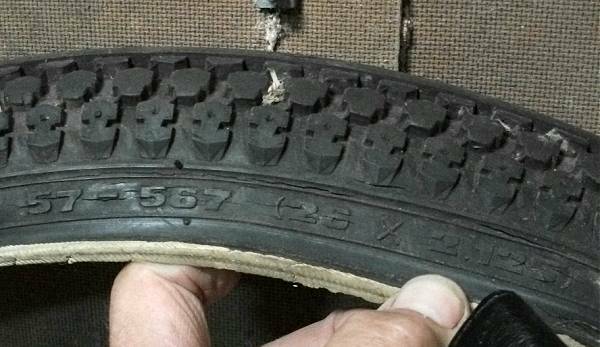 The information (or misinformation) in this tyre guide has been cadged from a number of sources, but mainly Michelin Tyres, Vredestein Tyres, ISO 5775-1 and the Cyclists Touring Club.